Cost to have a home addition drafted varies greatly by region (and even by zip code). Get free estimates from drafters in your city. Cost to have a home addition drafted varies greatly by region (and even by zip code). How much does it cost to have a home addition drafted? Before you can create the home addition of your dreams, you'll need blueprints. Blueprints are typically created by a draftsperson using CAD software, with some assistance from an architect. For this example, we’ll look at the cost of getting blueprints for a two story, 1000 square foot addition. The average cost is $1200-$1500. Existing: this is when small changes are made to the existing layout of the house and are typically used for smaller additions or remodels. Traditional: these blueprints 1 are typically printed on vellum and are designed by hand. CAD (Computer-Aided Design: the new wave of drafting uses computer programs to create the blueprints 1, which are then printed on large-scale printers. A consultation and walk-through of your current home so the draftsperson can get an idea of the layout and where you want to put the addition (2-4 hours, or $200-$500). Homes that are in environmentally protected areas, such as being close to a reservoir or near a conservation area, may require additional permits or have restrictions on additions, which can add to the time and cost of addition blueprints 1. Likewise, historical homes or homes with unique architectural details may also require more time due to their unique requirements. This will increase the cost based on how many extra hours it takes the draftsperson. 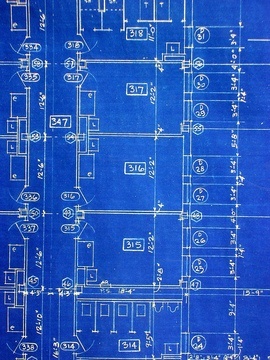 Some drafting firms provide printed blueprints 1 to the homeowners, which may add to the additional cost. Others provide digital or small-scale printed versions for free. Consult with your draftsperson to see what is included in your package. Creating a blueprint 1 takes time. If you need to rush the project for any reason, your draftsperson may add a rush fee that is up to 20% of your entire cost. Blueprint 1 and building plan requirements vary based on location. Check with your local building office or zoning department to get the required steps in your town. In some places, additions of a certain size (larger than 600 square feet or more than two stories high) may need to be certified by a structural engineer. In this case, the blueprints 1 are brought to the engineer, who stamps them with his or her approval. A stamp can cost $500-$1000 per blueprint 1 sheet. A similar process can occur with existing blueprints 1 and a stamp of approval by a new draftsperson. How much does it cost to have a home addition drafted in my city? Cost to have a home addition drafted varies greatly by region (and even by zip code). To get free estimates from local contractors, please indicate yours.